Many hair extension methods require you to have at least some hair for them to work. For example, the Hot Fusion method uses heat and an keratin adhesive to connect your hair to an extension. Alternatively, the Micro loop method loops your hair through a small plastic piece attached to the end of an extension. These are just a few examples of how your own hair is used when you get extensions. All of these methods are great for getting amazing looking hair, but what do you do if you don’t have hair to begin with? That’s where lace wigs come in. Lace wigs are the perfect solution to getting beautiful hair when you've got no hair to start with. They’re also good to use when you do have hair, but you don’t want methods that attach things to it. So, what exactly are lace wigs? As their name suggests, lace wigs are wigs which have lace in them. The sheer lace is used as a base for constructing the wig. It allows for individual strands of hair to be tied onto it by hand, giving an extremely natural look to the wig. Depending on your personal needs, there are different types of lace wigs that you can get. 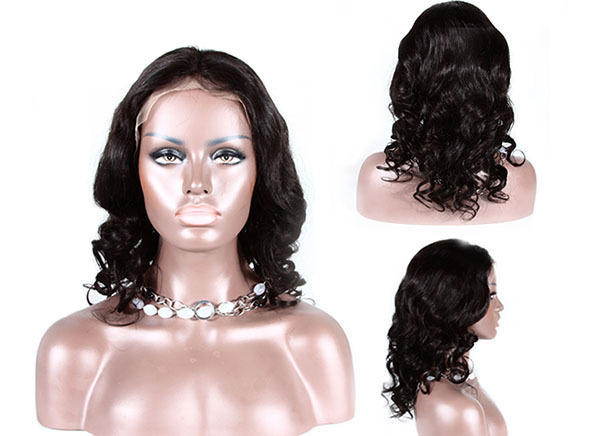 The two broadest categories are front lace wigs and full lace wigs. Front lace wigs are wigs which use lace in the front of the cap where the hairline is but use a different material for the rest of the wig. The other material is usually less fragile than the sheer lace, protecting your wig from rips and tears. Full lace wigs, on the other hand, are either made entirely of lace or have lace all along the perimeter of the cap and use another material in the center. The benefit of getting a full lace wig is that you can put your hair up into ponytails and other updos. In general, there are three things used to apply wigs: glues, tapes, and combs. When you plan on wearing a wig for a long time, or if you don’t have much hair, then you’ll likely be using glues and tapes. There are different types of glues and tapes that will affect how long you use the wig. Usually, these adhesives are transparent, making their presence undetectable. Also, for the best results, both glues and tapes will be used together to apply the wig to your head. They’ll be applied to your hairline and the wig will be attached, forming a tight bond between the adhesives and the wig for long-lasting results. On the other hand, using combs to attach a wig is slightly different. Because of how the combs work, you’ll generally need hair to wear wigs that have them. A stylist will first gather your hair into a cap and then check for loose strands. Then, they’ll trim the extra lace on the wig and place the wig on your head. The combs slide under the cap and into your hair. Many wigs with combs also have an adjustable strap in the back as well, so the stylist will adjust that to make a perfect fit. After that, you can part and style your hair however you like it.